After my surprising success with The Goblin Emperor, I thought I'd try some more modern fantasy, to see what condition the genre was in these days. 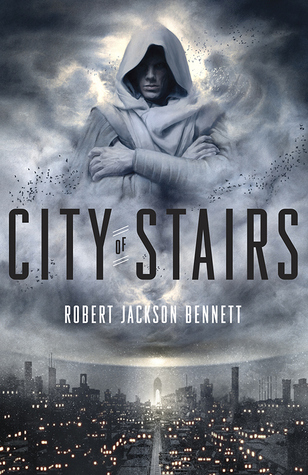 While Robert Jackson Bennett's City of Stairs doesn't quite hit the same bulls-eye, it's another indication that the genre is in ruder health than I'd expected. And that it can still provoke a little thought as well as entertain. City of Stairs takes the Twilight of the Gods plot from the hands of Eddings et al and asks the very modern question of what happens after they have gone. What if your typical fantasy pantheon provided the everyday miracles to run a continent-spanning empire and then suddenly disappeared? Seventy years on from a deicidal rebellion on the island colony of Saypur, after plague, civil collapse and military occupation by their former subjects, the former imperials are still struggling to get back on their feet. And nowhere more so than in the former holy city of Bulikov. Formerly a place of divinely inspired feats of architecture, it's now a tumbledown place of ruins and making do. Where once were palaces and towers complete, the stairs of the title rise up into thin air. The story centres around Shara, an intelligence agent for the Saypurian Government, and Sigrud, her hulking Nordic bodyguard. Having come to Bulikov to investigate the murder of Shara's friend and colleague, a historian studying the old gods, they quickly find themselves at the centre of political and religious intrigue, as well as alarming signs that the age of miracles is not as over as was thought. Bennett strikes me as a seat-of-the-pants writer than a meticulous plotter. Less a well-oiled machine of a novel than a mildly erratic gyroscope, City of Stairs gets where it needs to go, but not without telegraphing a few reveals in advance, venturing up a few blind alleys and letting stuff just happen, man. That doesn't stop it providing a great deal of fun along the way, not least due to Bennett's skill in characterisation. You know an author's got something when even the minor characters are memorable. Shara and Sigrud are characters I want to see more of, the latter in particular being not at all the one-dimensional meat shield you might expect. This being fantasy, both protagonists demand (and get) a crowning moment of awesome, one of which involves giant squid. Bonus points for furthering the tentacular cause there. The book also smartly inverts a few lazy assumptions. For example, the militantly anti-theist Saypurians are people of colour, while the formerly devout continentals are European-ish in culture and appearance. Bennett is most certainly not a didactic author, presenting us with a range of sympathetic and unsympathetic characters on each side of his world's spiritual struggle. He's acute on the social construction of belief and the emotional appeal of magical thinking, yet also shows that modernity challenges but isn't necessarily antithetical to religious practice. And the fantasy/steampunk crossover world of City of Stairs lends itself well to running with these themes. All of this helps Bennett get off the hook of the main criticism I'd level at City - other than the occasionally free-form plotting - namely that the villains have a little of the straw fundamentalist about them. A really good book would, I think, have had the courage to let them make their case rather than just twirl their moustaches and get their comeuppance. Given that everything else works so well, however, I'm letting this one go. In short - City of Stairs glitters. And even if it's not gold, it's certainly a valuable piece of work.